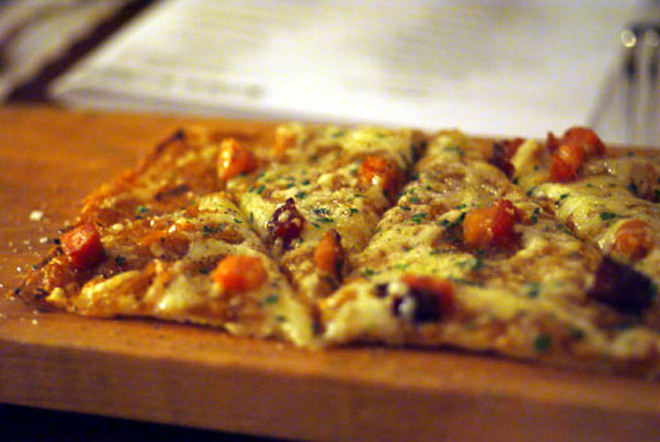 The thin, crispy tarte flambée has been on the menu since the days when Walter Manzke ran the kitchen, and in the hands of Laurent Elmerich, it hasn’t suffered. Inspired by a traditional dish from France’s Alsace region, the rectangular tart’s savory toppings—caramelized onions, applewood-smoked bacon, and melted cave-aged Gruyère—are so rich that one order will feed a big crowd. Or depending on how hungry we are, just us.